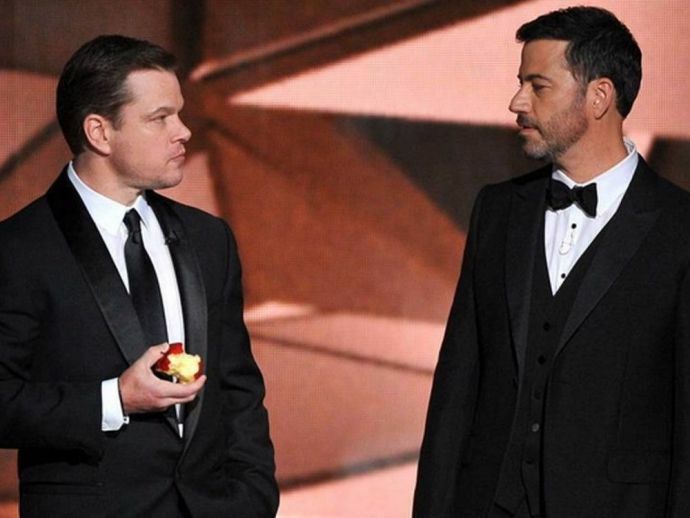 The 12-year-long feud that started on Jimmy Kimmel's show pestered Matt Damon at the 89th Academy Awards too. In the early days of Jimmy Kimmel Live!, the funny man made a joke about actor Matt Damon being bumped off the episode for lack of time (even though he wasn’t scheduled to appear at all). This started a faux feud between the two which has lasted over a decade, and continued in the 89th Academy Awards as well, which Kimmel hosted. While Damon, when asked about Kimmel anchoring, said, "I don't think I need to do anything to make his performance worse. He's gonna be really terrible no matter what." Among the many themes of the ceremony, one was the Humiliation of Matt Damon. Kimmel said he knew Damon for so long, when he first knew him, Damon was “the fat one”. In another section where actors talk about films and artists who inspired them, Kimmel decided to cite Damon as his inspiration, with his film We Bought A Zoo. He added that while Damon has “almost no discernible talent, but he works”. Of course Damon didn’t take it sitting down. Literally, at least. In what can easily be the most hilarious moment of the ceremony (unless you think the Best Picture goofup was funny), Damon was announced as Ben Affleck’s “guest” when the duo appeared to present an award. And adding insult to injury, the orchestra (conducted by Kimmel himself), became unnaturally loud every time Damon tried to speak. Just before the presentation of the Best Picture Oscar, Kimmel’s parting shot was that it was his favourite part, one that gave him the satisfaction of seeing Matt Damon lose an Academy Award.